John Lewis, piano; Percy Heath, bass; Kenny Clarke, drums. WOR Studios, New York, N.Y.
For over four decades, until his death on February 4, 2001, J.J. Johnson was the preeminent voice on trombone. So fixed was his position at the top of the polls--even during his years of film scoring and his subesquent retirement from performing--it is easy to forget that his stature with the public, and that of his peers among the moderninsts, was not always so exalted. 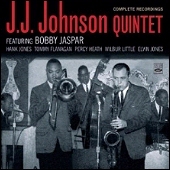 At the time this recording session took place in 1953, Johnson had responded to the lean times facing his jazz generation by withdrawing from full-time playing in favor of a more secure factory job. When the titles were reissued on 12" LP two years later, Johnson's fortunes had reversed, and he was celebrating the first of a string of poll victories that would spread across the decades. These are some of the performances that helped turn matters around. 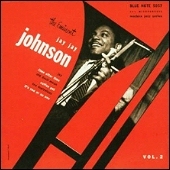 His early recording sessions for Savoy and Prestige, with the likes of Bud Powell, Sonny Stitt and a young Sonny Rollins among the supporting cast, also marked Johnson as a gifted composer and arranger, while two years touring in the popular small group of his former Basie-mate Illinois Jacquet helped raise the trombonist's profile with the public. Around 1950, the music business went through one of the periodic downturns that have always seemed to hit jazz artists earliest and hardest. Being a serious and responsible individual with a family, Johnson opted for a job inspecting blueprints in a Sperry factory in 1952. As with several of his famous contemporaties, what kept him in the public eye to any extent at all was his affiliation with Blue Note Records, which began at a 1950 date led by Howard McGhee. Another trumpeter and close friend, Miles Davis, featured Johnson in two of his sextets for the label, including an April 1953 session (Miles Davis, Vol. 2)that included two Johnson compositions. 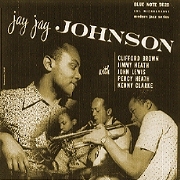 Like Davis, Johnson would record three sessions for Blue Note in this period that were released on the short-lived 10" LP format. This was the first of the three, and turned out to be a most auspicious gathering of giants. Sensational trumpeter Clifford Brown was making only his third jazz date, having recorded with Lou Donaldson for Blue Note and Tadd Dameron for Prestige earlier in the month of June. At the end of August, he would debut as a leader in his own Blue Note session (Clifford Brown Memorial Album). Jimmy Heath, still primarily known as a former alto player so close to his idol Charlie Parker he had been nicknamed Little Bird, and his brother, bassist Percy Heath, were both with Johnson on the April Miles Davis session. John Lewis, Percy Heath and Kenny Clarke had already begun working with vibist Milt Jackson in what would become the Modern Jazz Quartet. Both Heaths, Clarke, Jackson, and Davis had also logged time with the trombonist in a short-lived group associated with deejay Symphony Sid called Jazz, Inc.
"Capri" was written by the talented alto saxophonist/composer Gigi Gryce, who would soon team with Brown in the Lionel Hampton band and on several recordings. The inspiring chord sequence finds Johnson anything but rusty in his two choruses, with Heath, the extremely confident and fluent Brown and Lewis following. The master take (recorded after the alternate) is slightly faster, with a more outgoing solo from the leader and a strong saxophone chorus that suggested Charlie Parker on tenor to original annotator Leonard Feather. "Lover Man" is one of two ballads included here that make one wonder how Johnson ever got tagged as a "mechanical" player. His sound is tender and he embellishes the melody gracefully, while his arrangement uses the other horns judiciously and to telling effect. John Lewis is also outstanding in his eight-bar solo. "Turnpike" [mp3] is Johnson's only composition on the date, with the bold introduction yielding a contrastingly simple two-note theme akin to Monk's "Thelonious" in the A section of the AABA chorus. In their second choruses, each soloist blows over a pattern based on the cycle of fifths that is scored for the other horns when Jimmy Heath and Johnson take their turns. Jimmy plays baritone sax in the ensembles and tenor on his solo choruses, while Clarke and Percy Heath step forward on the out choruses. The later alternate take finds each of the horn players sustaining his exemplary level of execution, with Lewis in a playful mood. The pianist's more serious side emerges in "Sketch 1," a theme of stately beauty that one can imagine being interpreted by the MJQ. Lewis's arrangement takes the melody through several moods with Jimmy Heath's baritone sax initially in the lead, the composer offering more ruminative consideration, Brown in a rare muted appearance after a dramatic ensemble flourish, and Johnson at his warmest. The trombone solo is followed by an out-of-tempo variation for the horns before the baritone sax restates the melody. Brown and Jimmy Heath lay out on "It Could Happen to You," a contemplative Johnson ballad feature enhanced by Lewis's articulate accompaniment. All members of the quartet bear down at the start of the second chorus without resorting to double-time, and Johnson frames the whole performance with a lyrical introduction and coda. Spirits soar again on "Get Happy," where Johnson gets a great sound from the three-horn front line. Everyone is loose, strong, and extremely comfortable with both the hard swing generated by the rhythm section and the harmonic suspension that Johnson employs in the final eight bars of each blowing chorus. The later alternate take finds the trombone beginning with a cleverly oblique quote of "Why Was I Born?," while Lewis is limited to a single chorus. It would be another 14 months before Johnson returned to the recording studio as a leader. On that occasion, he teamed with fellow trombonist Kai Winding on Savoy for what proved to be the start of a popular two-year partnership. Two more important sessions without Winding followed, a quartet with Wynton Kelly and Charles Mingus and a quintet featuring Horace Silver and Hank Mobley, and are collected on The Eminent J.J. Johnson, Vol. 2. Eminent Jay Jay Johnson, Vol 1., RVG.